Table Height: 35" + Wheels 5" = Total 40"
AmGood Supply offers a wide selection of stainless steel work tables with galvanized legs and undershelf. 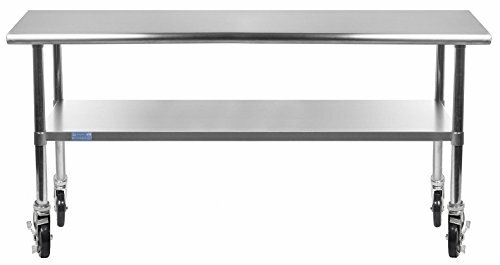 All work tables are made with T-430 18 gauge stainless steel, designed to be easily assembled, and are NSF approved. Stainless steel work tables are commonly used for food prep in a commercial kitchen, as a work desk, assembly line table, work bench, and in many other residential, commercial and industrial applications. AmGood Supply work tables are known for their premium quality and economy prices. Yes, a set of screws and an Allen wrench are included. Table Height: 35" + Wheel Height 5" = Total Height 40"